When the early sub-surface train tunnels were built, they were laboriously lined with bricks by the builders, but when the first deep tube tunnels were constructed, they had to switch to curved iron plates that were bolted into place. More recently though, concrete has been the material of choice for lining tunnels – and when Crossrail starts tunnelling next month, the tunnel boring machine will leave a smooth grey concrete tube in its wake. The concrete segments that will eventually make up the tunnel have to be manufactured somewhere, and being rather large and heavy, it helps if they are made as close as possible to the tunnel. For Crossrail, that means a former railway depot in Old Oak Common near Paddington has been stripped clean of its old heritage and turned into a giant concrete production line. The actual bit where cement, sand and other bits are mixed to create concrete is a deceptively small machine outside the main building. 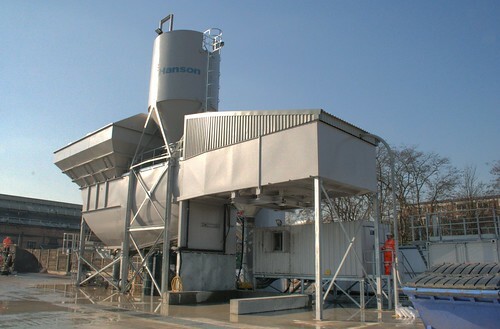 Although it is frankly, just a mixer, it is this machine that starts the entire process that will lead to the grey walls that will dominate the Crossrail tunnels for the next hundred years or so. The concrete used in tunnel linings isn’t just concrete though – it includes metal strips that reinforce it and add flexibility, and polyfibres which help improve resistance to explosive spalling — which is the build-up of water vapour pressure in the concrete during a fire. It’s a similar mix as to was used in the HS1 tunnels, with a few slight modifications. 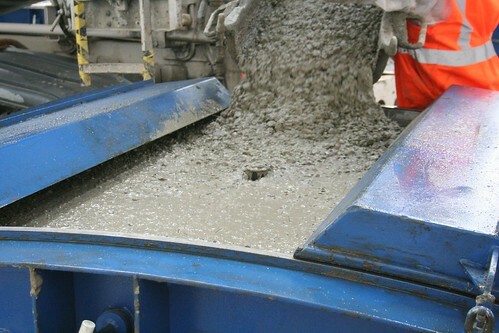 The exact mix was proven about a week ago when some tunnel linings were heat tested to ensure they worked as expected. 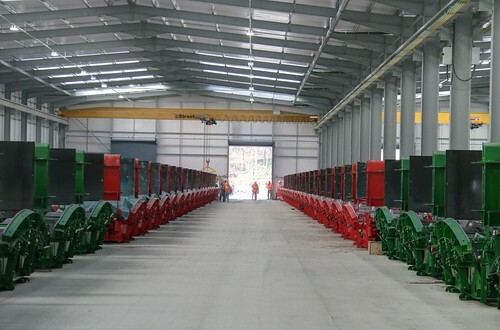 From the mixer though, conventional in–transit mixers (aka, cement lorries) transport the concrete mix the short distance to the huge metal shed that dominates the site – for in here are rows of giant moulds waiting to receive their deliveries. There are 213 moulds in total – each metal mould being also powered to vibrate vigorously as the concrete is poured into them. After seeing the concrete in one freshly filed mould burbling away a bit as it settled, I was strongly reminded of the opening scenes to the James Bond movie, Diamonds are Forever where the villain is drowned in hot mud. 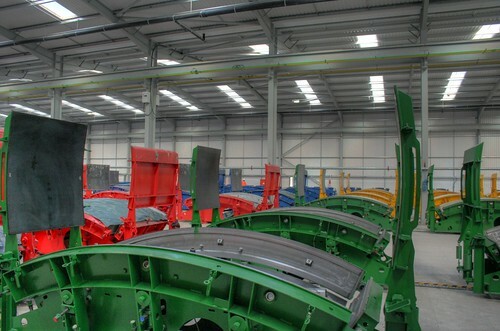 For a concrete forming factory, it is surprisingly colourful as the moulds are colour coded to designate the type of ring segment they will form. There are 1.6 metre and 1 metre wide segments, each curving very slightly to the right or left. In straight tunnels they will alternate, so it wont be actually straight, but an almost imperceptible zig-zag effect. Each ring is made from 7 main segments, then a single smaller keystone. White moulds will create the curved corners that will lead to side passages. 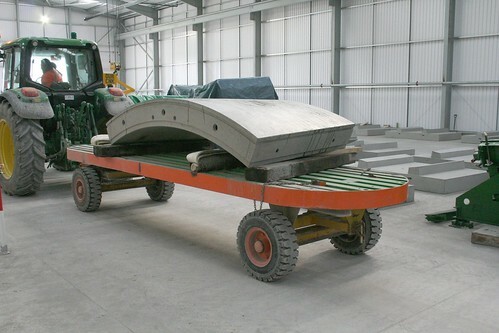 One of the earlier mentioned delivery trucks will provide enough concrete for 2 and a bit moulds, and they tend to operate a continuous pouring process when at work. 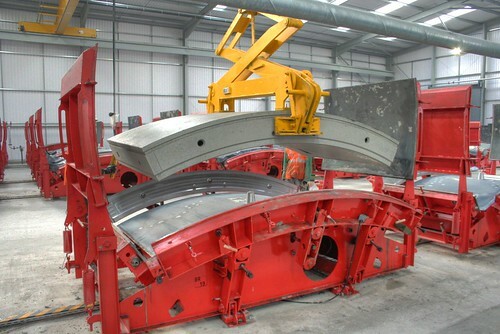 Due to the way the moulds have to be designed, they form the ring segments upside down to how they are to be stored and delivered to the TBM later – so each one has to be flipped over by a giant flipping machine. Rather amusingly, or poetically, depending on your point of view, when each segment is removed from the mould it is put on a truck, and there will rest on two old railway sleepers recovered from the previous site use. Old railway technology helping a modern railway to be constructed. Once flipped over, they are taken outside to the storage yard where each pile will make up one ring segment, and will be stacked in the order needed for large gantry cranes to be able to collect them and put them on trains for delivery down to the tunnel entrance at Royal Oak, just outside Paddington. Each ring is formed with some codes from the concrete mould to indicate which mould, which position the segment is for and the project number. An ink stamp applied to the side indicates date of manufacture. There wont be any “masons marks” left by their builders though. Incidentally, because they are right next to an operational railway, all the warning hazard lights flash blue, not red. For railways, red lights mean stop, and thus flashing red lights next to a railway can have unwelcome side effects. They expect to be producing 20 rings per day when production is at full speed, which indeed started last week. There will eventually be about 100 people working on site, with a number of locally hired apprentices and the whole site has to be vacated at the end of 2013. It will later become a depot for Crossrail trains. With all the focus on the big shiny TBM next month, and the ongoing works at the train stations, it is sometimes easy to overlook the remote outposts of the construction process even though they are vital to the task. When whizzing through a Crossrail tunnel in a few years time, that grey blur you can just about see through the train windows came from this factory. A load more photos here. The Victoria Line was the first tube to be (almost) completely concrete lined. includes a look at the manufacture of segments for that line. It will be an interesting comparison with modern methods (and workwear!). Forever in awe of how you get such amazing photos, especially when they are combined with such informative text. I’ve learned a lot today. Superb photography of one of the key driving elements of the entire Crossrail programme. Have you ever thought about approaching the Curator of the London Transport Museum with a view to exhibiting your works – you should not be shy of shunning the concept of hiding your light under a bushel – or down a tunnel as in this case?. Don’t be too sure about my photography skills. I mucked up my camera settings and every photo I took at the next site I visited were ruined. Photo of me with the TBM earlier this week at Royal Oak on my blog. Special for me as I used to park 80 buses on this site….. Fantastic pics, Ian. Particularly fond of the giant flipping machine, to go with the enormous boring machine! 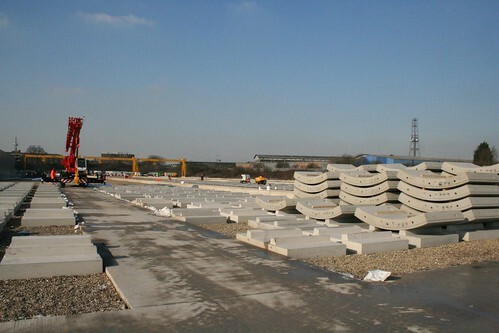 1 Pings/Trackbacks for "Photos from inside Crossrail’s concrete factory"